Mother Mary Wendy McMenamy is originally from Daytona Beach, FL. Mother has a twin sister and is the 2nd eldest of eight children. In 1982, at age 21 she joined an Italian Community, the Handmaids of Reparation to the Most Sacred Heart of Jesus, which was founded by Venerable Msgr. Anthony Celona in Messina, Sicily. Mother Mary Wendy made her first vows on the Solemnity of the Sacred Heart of Jesus in 1985, and her Perpetual Vows on the Feast of St. Clare in 1990. After seventeen years of Religious Life, she felt a strong urging from the Lord to renew her community by returning to the original inspiration of the founder. On December 4th, 1998, His Excellency, Bishop Gilbert Sheldon welcomed the foundation of a new community, the Sisters of Reparation to the Most Sacred Heart of Jesus, in the Diocese of Steubenville, OH. On Palm Sunday, 1999, Mother went to Tusa, Sicily, to meet Padre Umile di Maria, F.M.R., her Spiritual Director, who helped her formulate the new Constitutions. These Constitutions were subsequently approved by Bishop Sheldon in the Jubilee Year 2000, on the Feast of the Birth of Mary. 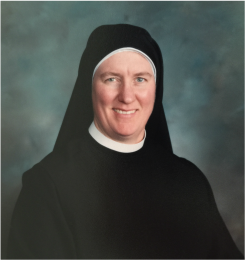 Mother Mary Wendy McMenamy is the Mother Foundress and Mother Superior of the Sisters of Reparation.